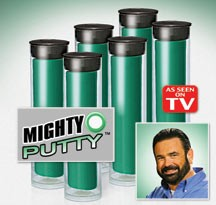 Mighty Putty is one of the last products sponsored in part by the late Billy Mays. Boasting the ability to bond numerous materials with the holding power of epoxy, including water pipes, I wondered whether this stuff could tackle a problem with some leaking HiTec solar pool heating panels. Some years ago, I had a HiTec solar system installed to heat my swimming pool with solar energy. Consisting of a series of black panels of tubes which convey pool water up and onto the roof, given enough sunlight the system makes an otherwise chilly pool very swimmable. Made of a rigid, ultraviolet-resistant plastic, the panels can be damaged by, say, falling tree branches or, as my contractor claimed, squirrels. The contractor who installed the system claimed that leaks that had developed in a couple of the panels recently were attributable to "squirrel damage" which conveniently for them is one type not covered by the manufacturer's limited warranty. Aside from the fact that no plastic-hungry squirrels nor squirrel spoor laden with plastic shavings had been discovered on my property, making determining the actual cause of the damage a difficult enterprise to say the least, this also meant that the contractor would be able to collect a roughly $135 service call fee to service the system for an out-of-warranty repair. How convenient that the contractor could fall back on these dastardly, elusive squirrels as the cause and not something actually covered by the warranty! I wondered whether Mighty Putty might be able to save me some money. I had basically two types of defects that had arisen in one of the panel arrays. 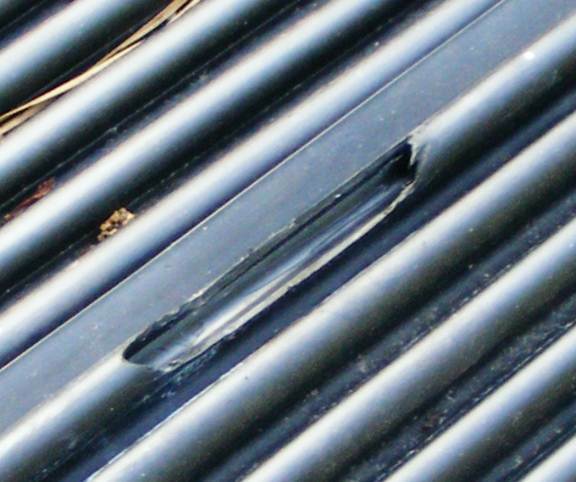 One was a section of one of the tubes that appeared to have cracked off, a structural defect about 2" long. Before application... a huge chunk of tube is missing. 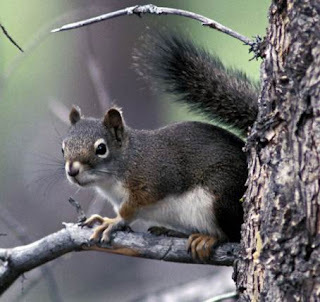 Another consisted of pinhole leaks caused by abrasions to the plastic tubing, whether by falling tree branches impacting the panels, or the aforementioned scrabbling squirrels. Generally, since a solar system benefits from as much sun exposure as possible, installation under trees is inadvisable, but sometimes unavoidable. Unfortunately, a pine tree, a few of whose branches overhang the roof, probably were the culprit, both as a result of falling debris and as a squirrel habitat. Following the instructions, I sliced about a 1" wide section of Mighty Putty, and kneaded it thoroughly for several minutes until it became a uniform, grayish consistency indicating that it's ready for use. I roughened the area around the breach with some sandpaper and blew the resulting dust away. Then, I molded the putty into roughly the shape of a drinking straw cut in half lengthwise, large enough to encompass the hole and replace the missing plastic. Finally, I molded the putty patch onto the empty area and took care to apply even pressure all along the seam to ensure maximum contact with the plastic. After application, covering the gap. The pinhole leaks required slightly less putty to fix, but a similar process. To these I applied small dabs of putty sufficient to completely cover the holes. For plumbing repairs, the makers of Mighty Putty boast a cure time of as little as 30 minutes before pressure is restored. HiTec states that their panels are pressure tested up to 90 psi, but that typically a swimming pool solar heating system will hover around 20 to 40 psi. I figured that this pressure is probably less than that of household plumbing. I would soon find out for sure. I climbed the roof, applied the putty, and allowed it to set for a full 24 hours just to be safe. The result? Success! The putty stopped the leaks in their tracks. It remains to be seen whether the putty will stand up to daily exposure to sun and chlorinated, pressurized pool water, but for now, the putty fully filled my expectations for far less than the cost of a service call, as well as saving me the time and trouble that would necessitate getting the perforated panel replaced outright. Well done, Billy Mays. R.I.P. Is it for all Plastic material or for specific materials. 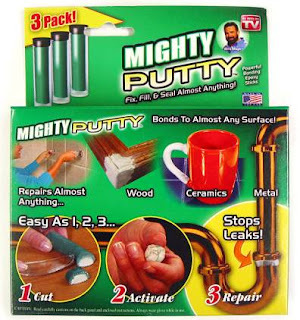 The Mighty Putty product claims to work on wood, plastic, metal, etc. It's a type of epoxy and seems pretty versatile. 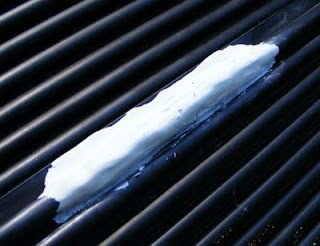 Where can I buy Mighty Putty, would like to try it to see if it works on my solar heating panel? This putty (aka epoxy) can be found in hardware stores, pool stores and places like home depot. 20 dollars gets you a large box, and it works under the water line on in ground pools. Seals solar panels well. I would not fix a solar panel this way. Water will be stuck in the panel, and later freeze, and split the tube, causing a new leak. You must mechanically block both ends of the tube at the 2" or 1.5" headers, depending on the header size. Freezing will occur any time there is no wind and the air temperature drops below 40 degrees on a clear night. This is because anything black will radiate heat energy into outer space, and drop well below the air temperature. That's why water droplets form on surfaces after sunset. Consult the manufacturer of the panel for proper materials and methods. BTW I have 39 years in the solar industry. Thanks for your input, Solar Water Heating. However in the case of my setup, it has overflow valves which if I'm not mistaken would prevent water from accumulating. The idea with patching the leaks is to plug the leak at the surface, but not block up the tubes anywhere along the lines of flow. If as in my case your warranty doesn't cover squirrel damage, this might be a reasonable workaround, but certainly not the best fix out there. I just couldn't afford to pay over $100 a pop to have the installer come out and repeatedly fix leaks (which, other than replacing panel modules, was the only recourse aside from maybe getting a more expensive setup with metal tubing instead).